The home is the most important place for the seed of faith to take root. Faith formation classes always assist – and never replace, the influence of the family on the young person’s faith. Our students must, by God’s grace, come to love our Lord Jesus Christ, and to love His Holy Catholic Church. Eternal life in heaven is our ultimate, and ever present goal in this life. 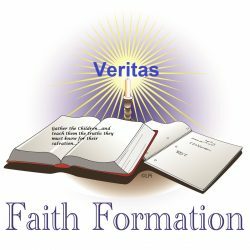 The Veritas Faith Formation Program is open to students in Grades 1 through 12; as well as various Adult Study opportunities. Students must be from active, registered parishioner families of Ss. Peter & Paul, or St. Mary of the Angels Parishes, in Green Bay. Students in Grades 1-12 will have their regular classes on Wednesdays. Grades 1-4 will meet from 4:30pm to 5:45pm. Grades 5-12 will meet from 6:15pm to 7:30pm. Sacramental Preparation (First Penance, First Communion, and Confirmation) will involve several hours of additional instruction, which will occur over several weeks prior to the date of reception of the sacrament ~ on a weekend day – according to language spoken. See the VERITAS Formation Calendar. The Text Book series used in our parish is Faith and Life, published by Ignatius Press. Catechesis corresponds to the four pillars of the Catechism; covering Catholic doctrine, morality, sacraments, and prayer. The Text Books used by our High School grade students are from Didache Series – Parish Edition, published by the Midwest Theological Forum. The lessons draw from the Catechism of the Catholic Church, Sacred Scripture, the lives of the saints, and the Doctors and Fathers of the Church. The Didache series texts and materials are approved by Bishop Ricken, by the United States Conference of Catholic Bishops, and are in conformity with the Vatican’s General Directory for Catechesis. For more information, Click Here. Bibles, Bible Storybooks, and other materials will be available for student use as needed in each class. Sacrament-Specific materials will be used to prepare students for First Penance, First Communion, and Confirmation. Together with the texts and materials listed above, the program integrates Prayer, Lives & Examples of the Saints, Morality & Holiness, and other activities pertinent to our Faith and Life as Catholics.